Breaching the Citadel, part of the Sexual Violence and Impunity in South Asia series, supported by the International Development Research Centre, Canada, puts India in focus, showcasing new and pathbreaking research on sexual violence and impunity. Bringing together both young and established scholars, the book explores medical protocols, the functioning of the law, the psychosocial making of impunity, histories of sexual violence in places like Kashmir, the media, and sectarian violence, among other timely topics. The essays Urvashi Butalia has collected here were developed through comparative research and a series of workshops, so each entry is peer-reviewed and on the cutting edge of the field. 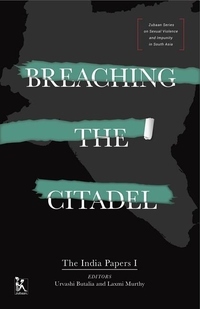 Breaching the Citadel breaks new ground as it uncovers and analyzes the link between sexual violence and the structures and institutions that enable perpetrators to act with impunity.